Obviously this is Hannah's own header- full credit to her! Hannah, the brains behind Pull Yourself Together, is someone I've had on my twitter feed for a long time, but we had never really chatted, until bumping into each other at CarnLIVal. I had seen a girl with space buns and a waving cat sweatshirt and thought she seemed familiar, so when she came over and started a conversation with just me, trust me, I gave it a chance. She immediately made me feel comfortable, and within minutes I was showing her a mysterious rash- the lucky duck! You see, Hannah is a few months away from being a doctor. An actual doctor. I'm in awe of anyone who dedicates herself to helping others, but what makes Hannah even more remarkable is that she has done it while battling with her own mental health. What. A. Boss. 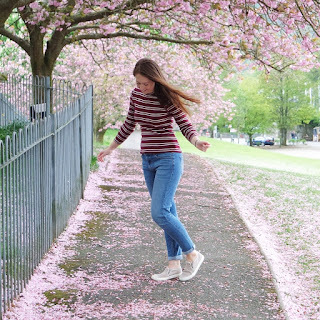 As well as helping and healing offline, Hannah makes a dedicated effort to uplift and inspire over on her blog, which I have become a little obsessed with. The photos are gorgeous and her writing is just beautiful and cosy. You can immediately feel the love for her friends and family, her appreciation for the simple things, and just general good egginess. She ends each post with an encouraging quote, and isn't scared to speak out about serious matters, either. I feel like Pull Yourself Together is a blog to bookmark and dip into when you're feeling down. It's a big hug and a hot cup of tea, and I know that Hannah's attitude can make anyone feel better. A difficult read but one that very much sums up Hannah as a person, a medical student, and a blogger. ...and this one sums up that cosy, family vibe I was talking about! There are some stunning snaps in this post, too. Who have you been loving lately? What a nice testament, I haven't read Hannah's blog before but I'm heading over there now. A DOCTOR THO!! !